Yesterday we told you that we wanted to set a challenge.... a challenge to banish boring dinners. Why? Well, because a recent study found that the average cook rotates the same nine recipes for dinner over and over again. In Australia the most popular dinner is Steak and Vegetables, closely followed by Spaghetti Bolognaise - and whilst those two dishes can be delicious, they definitely get boring if you're eating them over and over again! 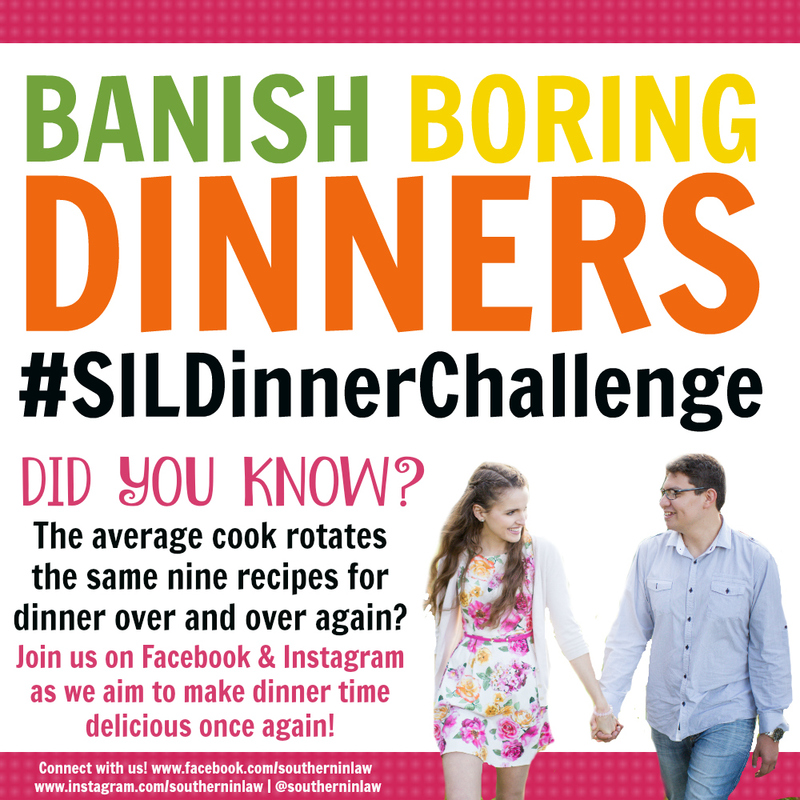 We're starting the #SILDinnerChallenge to bring a little bit of fun back to the dinner table. We want you to get creative and make dinnertime delicious once again by joining in and sharing your dinners with us on Facebook and Instagram. We're also lining up some competitions and delicious prizes for those joining in so we can make creating these dinners even more fun - and the more people joining in, the more inspiration you'll have when you're deciding what to cook. How do I join in? It's pretty simple! If you're on Instagram, simply #SILDinnerChallenge when sharing your photo and tag us @southerninlaw so we can see it! If you're on Facebook, post your picture on our Facebook wall or share it when we post our dinners each night. If you don't take a picture, you can still join in the conversation! We still want to find out what was on your dinner table so be sure to leave a comment! But what if I need inspiration? Don't worry! There will be inspiration a-plenty! As well as sharing our dinners each night, we're working on developing lots of tasty new dinner recipes that are healthy, delicious and quick so you always have something to cook! But tell me, will you be joining in on the fun?! Feel free to leave your Instagram @name or Facebook page link below so other readers can connect with you too!